Do you wonder sometimes when was the last time you heard some really different sounding music from a band that doesn’t try to sound like everybody else? If yes, you probably know that there are very few such delectable artists out there, and often they are hard to discover because they don’t get the same amount of media coverage as those that are easier to sell to the people. Japan seems to be one of those places that is still a fertile breeding ground for original music, with bands like Boredoms, Acid Mothers Temple, Boris,… just a few of the outstanding exports from the Far East. Mouse On The Keys are still a relatively new band, but two of their members used to be in Nine Days Wonder, a post rock band that was also known outside their native country. Their first EP and longplayer were initially only released back home, but Denovali is taking care to make their two records available to the rest of the world. They start with the trio’s debut EP Sezession that works already as a great teaser to this truly special band. 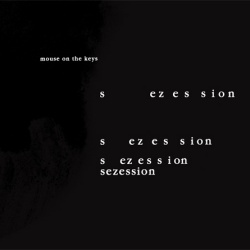 Consisting of a two keyboaders and a drummer, Mouse On The Keys combine the energy of rock music with the technical prowess of classical music and jazz. The drums come with a lot of fierce energy, while the two other members fitfully switch between acoustic piano and electric keyboards, never forfeiting a special warmth that makes their music so addictive. The only drawback is the short running time, but their longplayer will soon follower. Among the four tracks, all of which are flawless, two stand out even more: Toccatino is an interpretation of a piece by Ukrainian composer Nikolai Kapustin, Raumkrankheit, with six minutes running time the longest cut, comes with a guest saxophonist that helps emphasising the jazz component. The only other band with a similar sound I can think of is the Crimson Jazz Trio, who specialise in covering classics by King Crimson. Mouse On The Keys mostly play their own material that comes with such a maturity that it would be a crime to withhold their music from the rest of the world. If their longplayer can keep up this level, I will not hesitate to give it the maximum rating.